Performance Time: Approximately 45 minutes, 42 pgs. COMEDY. 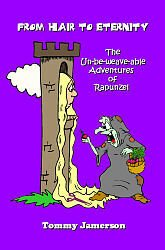 There’s a witch, a spell, and lots of radishes in this wildly wacky adaptation of “Rapunzel.” Locked in a tower by a witch, Rapunzel’s boring life comes to an end when she meets a prince who wants to rescue her from the tower and marry her even if he has to have a witch for a mother-in-law. When the Witch discovers that the Prince has been secretly visiting Rapunzel, she punishes Rapunzel by cutting her long lovely locks and giving her the dreaded, abysmally appalling hairdo…“The Mullet of Doom”! Will Rapunzel’s mullet doom her to a lonely life inside the tower, or will the Prince promise to love her from hair to eternity? This hair-raising, unbeweaveable comedy has a minimum set and is perfect for touring groups. Tommy Jamerson has been a playwright for more than a decade and is the author of several children’s plays. He studied theatre at Indiana State University and is a graduate student at the University of New Orleans. Mr. Jamerson has served as a high school playwriting competition judge and has worked for the Horizon Theatre Company as a playwriting apprentice. He resides in Caldwell, NJ, with his partner, Mark, and their dog, Darby.